With green screen installations spanning the United Kingdom, it is great to receive feedback from across the water from our colleagues in Northern Ireland. One of a realm of living green installations has recently been completed by Traad Nurseries, based in Magherafelt, Northern Ireland. Traad are members of the Association of Landscape Contractors Ireland and are established landscapers servicing the whole of the UK. In an atrium created beneath an expanse of accommodation at a new Heathrow hotel development, Traad were tasked with screening the courtyard. 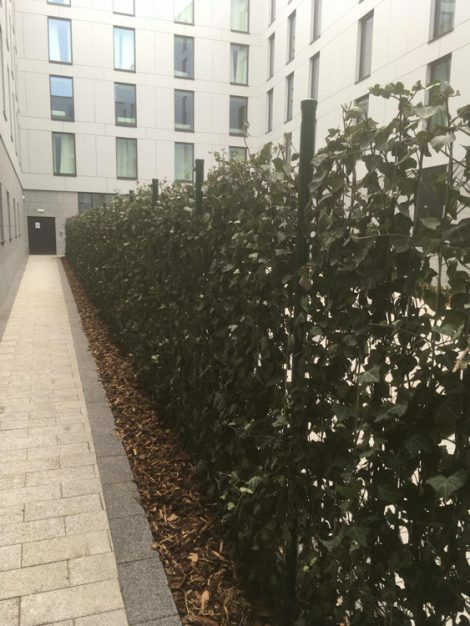 Used by hotel customers and staff alike as a break-out space and communal area, the central green space needed privacy and a natural screen to allow for a little time-out for its commercial and residential visitors. The Mobilane ivy green screens, regularly chosen by Traad as their screen and supplier of choice, tick all of the boxes from the client and installers perspective: naturally attractive, dense and visually appealing without being too imposing or intrusive. A great alternative to a tangle of climber-filled trellis, the ivy screens achieve their objective – screening – from day one. 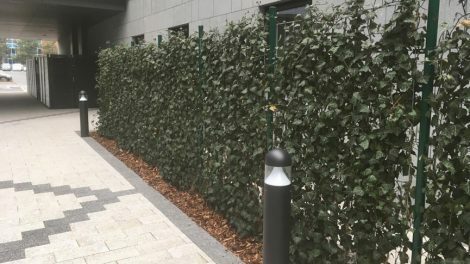 Gareth Cassidy from Traad and the landscape architect, David Clarke, worked closely with McAleer-Rushe, the main contractor (Design and Build), selecting the appropriate screen height and planted varieties before supply and installation in November 2018.